In “post-Christian” Europe, where only a small percentage of the population has ever been to church, these rocks of iniquity have piled up over many centuries. They must be cleared away for the people to return from captivity. Our mission is to come alongside the local body of believers and help do the heavy lifting. We have seen that when the stones are removed, the Lord comes! When corporate sins are cleansed by prayer, repentance and reconciliation, the church of the nation begins to “wake up”, the people hear the gospel, and the nation is strengthened towards righteous rule. Historical bloodshed and violence: persecution and martyrdom, the Crusades,Thirty Years War, genocide, holocaust, WW1, WW11…. Idol worship: present day and ancient gods and goddesses of Greek, Etruscan, Roman & pagan origin, whose shrines and “high places” are tourist attractions or churches; materialism; ancestor worship; the cult of celebrity, etc. We thought it might be helpful to share several examples from past prayer work, to show how cleansing these iniquities brings tangible results. Each of these nations is “in progress” towards revival, but prayer has enabled a spiritual highway to be built. Switzerland and the Anabaptists (Amish, Mennonite, etc. ): For 300 years the Swiss Reformed State Church persecuted Anabaptists. This contributed to a spiritual dullness over Switzerland and also created a need for spiritual healing among Anabaptists. In 2002, God asked our small group of intercessors to identify with and “stand in the gap” for the past and present sins of the Anabaptists, which we did for eight months. In each meeting we confessed a specific area such as fear of man, pride, idolatry, etc., asking God to forgive, cleanse and heal. These prayer times led us to a next step of Divine reconciliation and repentance gatherings between Anabaptists and people of the Swiss Reformed State Church. At that time most of Switzerland knew very little about this darker part of their nation’s history. But because of much prayer, reconciliation and repentance, Switzerland hosted “The Year of the Anabaptist” in 2007. And through the Anabaptist story, the Swiss media is spreading the gospel to the entire nation of Switzerland. Italy: Throughout the year 2000, with Italy For Christ, we served evangelistic teams who came to share Jesus during the “Catholic Year of Jubilee”. Wherever we went throughout the country, the teams prayer-walked and we asked God to send to Italy those who carried the spiritual authority to deal with “spiritual forces of evil in the heavenly realms” (Eph. 6:12). We asked God to deal with the spiritual darkness that veiled the churches with legalism. 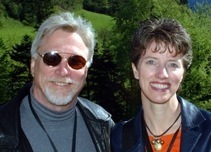 In 2005 we returned to Rome, rejoicing at the tremendous spiritual growth we saw in the local churches. We had come with Global Harvest to pray over two places of great historical martyrdom: Circus Maximus and the Pozzuoli coliseum. Together we worshipped, repented and forgave the sins of the Roman empire against the Church. We took communion and poured out the remaining wine on the earth, to cleanse the ground from the centuries of bloodshed. When C. Peter Wagner bound the strongman of Rome, we remembered our prayers from five years earlier for the principalities to be brought down! It was a great day of victory for the Italian church and an encouragement to us that seeds of prayers sown do eventually grow and reap fruit. The church there continues to be strengthened and to grow in faith and good works. France: In 2004, a word at a European conference warned that time was growing short before God would allow judgment to come to France. Taking that word seriously, Rusty joined several French leaders in 2005 to visit intercessors in 30 cities with a call to rise up and pray for their region. Recently, God is moving in some of these cities with a measure of healing, intercession and revival. In one city, pastors have repented for competition and have begun to work together to reach the unsaved. The city has also taken responsibility for its part in historic slave trading. In 2006 and 2007, another church led 3 walks of intercession: around the Alsace region, along the Swiss border and down the Rhone Valley. We joined them, praying cleansing over ancient high places of idol worship, repenting of Anabaptist divisions and of blood shed through much warfare, and calling back the prophetic heritage of the Huguenots. The region is now seeing signs of unity and cooperation. All of these changes are evidence that France is beginning to awaken from its spiritual slumber. Germany: God directed our attention to the city of Landau, Germany, though we weren’t sure why! We only knew we were to go there to pray and worship and bless the town. Things became clear when by Divine appointment, we met a pastor who had been praying to see his region made alive in Christ’s power. We invited him to a “transformation seminar” in America, where he received the mantle to begin covering his region in unified prayer, repentance and reconciliation. Later, God enabled us to connect him with other German prayer leaders to strengthen and support his call to prayer. We expect that the fruit in Landau will be a new spiritual openness and the establishment of a transformational training center in that region of Germany within the next several years! We realize we’re sowing seeds that take time to harvest: perhaps three, five, ten years. The pattern we’ve seen is something like this: First, God reveals one of the “stones” on the highway in a particular nation. Our hearts are burdened to research the history of that situation and to pray. Through prayer, God gives us a strategy to know what action is required and a sense of His timing. And along with strategy has always come His amazing, Divine connections with people in the places where we are to go and pray! Then we simply carry out what we sense He’s asked us to do. The entire process from the revealing of a “stone” to the actual prayer trip can be anywhere from 3 to six months or even longer. Our work for the last six years has been part-time, but God has asked us to become available full-time so that we can go to more places and do more prayer work. There is an acceleration, a spiritual thrust in the earth right now and time is of the essence. There is a supernatural “new thing” God is doing in the Kingdom where regions, states and even nations are being covered by spiritual fathers and mothers who gather in prayer to wait on God’s “now” word and His strategies of implementation for their territory. We’ve sensed we’re to be part of this kind of “listening prayer” in America and we’re asking God to clarify our call and to put us in place as He desires. The fruits we’ve seen are dynamic and effective to establish God’s Divine Rule over an area. Fathering and mothering also includes taking younger generations along as we go, nurturing their gifts and exhorting to maturity as we work side by side in prayer journeys. We personally won’t be around forever, but if we help others to grow and learn from our successes and mistakes, the cleansing and healing of nations can then continue and increase in future generations. The goal of the work is for the harvest to come and the Bride to be made ready for Jesus’ return. To watch a short video of Pray Big in action, click here.